Our map showing the Maidstone town centre baby changer facilities has been ranked from 1-5 stars (5 being the best) based on my own research. Below is a table showing the exact breakdown of how these results were reached – the different categories scored and the total for each baby change facility. It also tells you the added information of whether each place is able to provide baby bottle warming facilities too. All handy information. 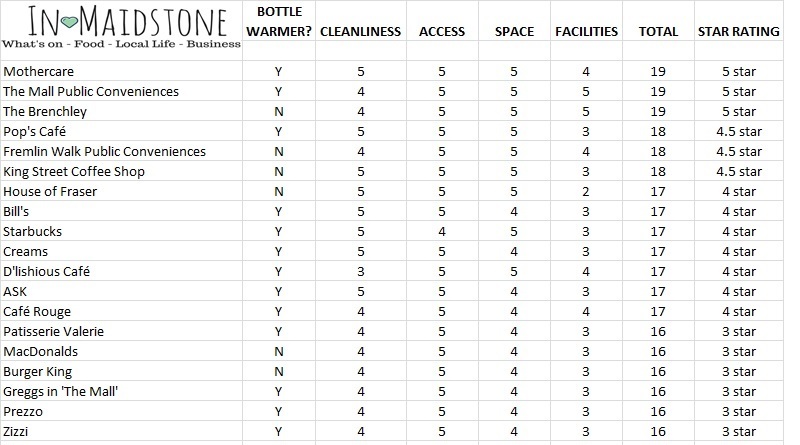 Following on from the table below, I have given a brief breakdown of my findings for each establishment so that you get the full overview of each and every one of the baby change facilities found in the Maidstone town centre and the reasoning behind the scores. 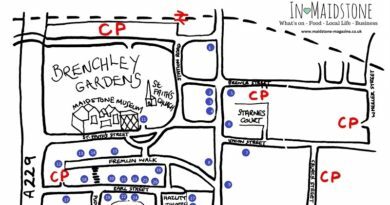 So the results are obvious – the 5 star top baby changing facilities in the Maidstone town centre are found in Mothercare, The Mall public conveniences and The Brenchley. 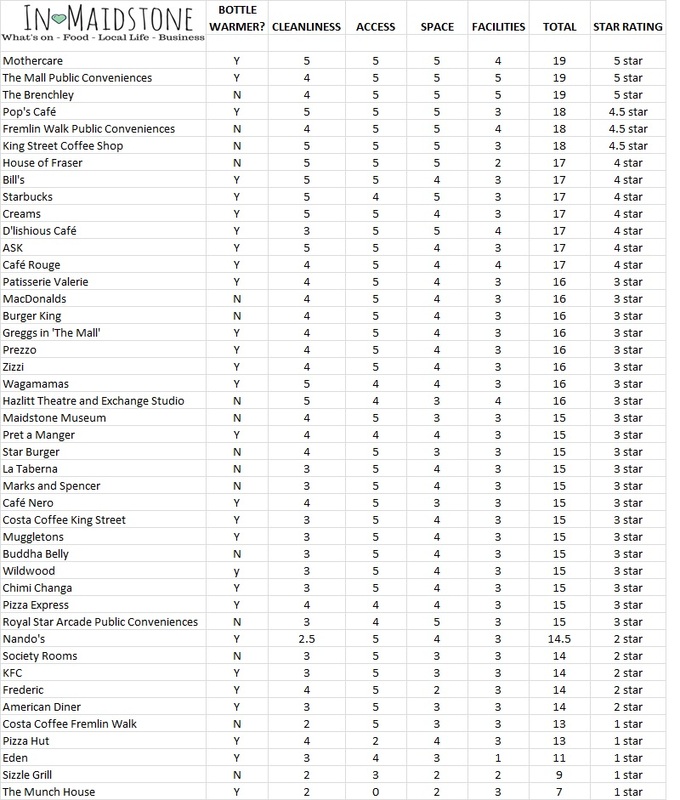 I surveyed every establishment on the same day – Thursday 22nd September – to ensure I could compare facilities without bias. Cleanliness – I have marked this based on smell, fullness of the nappy bins and an inspection of the baby changer, work surfaces and floors surrounding the baby change area. I mark this criteria as the most important for me. Access – This is fairly self explanatory. Some places do include a lift or the need for a key for access which does not detract from the score, I was looking for access specifically for those with buggies. Space – I marked this on whether there was room to fit a buggy in the changing facilities and the overall comfort it afforded. Facilities – Generally most changing facilities had a baby change table/area, toilet and basin. I judged these as the basic requirements and would score a ‘3’ but some considerations such as lack of privacy or awkward maneuvering to get to the facilities would make the mark lower. Bottle Warming – I spoke to a member of staff in each eatery above and asked them if they warmed baby bottles. For those who answered ‘yes’ some explained they would simply give a bowl of boiling water for the bottle to be placed into by the parent/guardian and others actual had bottle warmers – again to be used by the parents. All stressed that the heating of the baby bottle was the full responsibility of the parent/guardian. Mothercare – with more than one baby change station available, ample space, hand towels, baby changer paper liner, a hand basin, feeding station (to warm baby bottled and to feed your baby in private away from the shop) this easily became 5 star. The only facility lacking is a toilet but the other facilities made up for this. If it had a toilet this would be a 6 star baby changer – the only one in Maidstone. The Mall – I was surprised at the completeness of these facilities. The baby change gave privacy and provided access to toilets for parents, smaller toilets for toddlers and mini urinals for little boys. 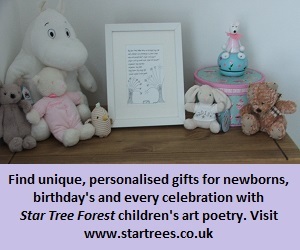 They are clean, spacious and exactly what would be needed in-case of a nappy explosion! The Brenchley – I was impressed by this because they had clean, spacious baby change facilities not just in the disabled toilet (where most eateries seem to include them) but also in the ladies and gents toilets meaning that baby changing is open to all. Many places only put baby change facilities in the ladies toilets which limits fathers when in town with little ones. Pop’s Cafe – This has one of the biggest baby change areas in Maidstone, clean, easily accessed and with all the amenities you would require. Fremlin Walk public conveniences – Baby change facilities available not just in the ladies toilets and situated in a private cubicle which was spacious, clean and gives all the needed facilities. King Street Cafe – this would have been scored a 5 star if they had a baby change in the men’s toilet as well as the ladies. The ladies toilet was clean, bright and spacious and the layout of the baby change area was well thought out. House of Fraser – the facilities were bright, spacious, private and clean with baby change lining paper provided. There is no toilet in the same facility – but the toilets were right next door. Some may say this would make it easier to keep the baby changer area clean but it is less convenient, as toddler siblings often coincide the baby’s nappy change with a sudden need to go to the toilet themselves! Bill’s – The baby change is in the disabled toilet which was clean and spacious and provided all the facilities you would expect. Starbucks – The access is via a lift but once there, the facilities are very clean providing everything I expected. Creams – Easily accessible, the disabled toilet facilities were big and clean. D’lichious Cafe – tucked away in Market Buildings this cafe has given thought to the change facilities by also providing a comfy armchair for mothers/father to feed their baby too. The facility was not as clean as some. ASK – bright, very clean and roomy these facilities are good with the basic facilities I would expect. Cafe Rouge – based in the disabled toilets the facilities are clean with the basic facilities I would expect. Patisserie Valerie – Good amount of space in the disabled toilet with required facilities and space. MacDonald’s – Good amount of space with required facilities and space. The only snag was having to get a key from the counter – which seems to be the norm in every fast food establishment. Burger King – Good size disabled toilet and facilities as I would expect. Again a key is needed for access. Gregg’s – The only place in The Mall other than the public conveniences that provides a baby change facility. Good size disabled toilet and facilities as I would expect. Prezzo – Right in the reception area this is clean, spacious, easy access and with everything I would expect. Zizzi – With easy access and a spacious disabled toilet facilities this provides everything I need from a baby change. Wagamamas – Access via the lift does not detract from the fact that the baby change facility is a good sized room with all the needed facilities. Hazlitt Theatre and Exchange Studio – The baby changer is situated in the ladies toilets in the Hazlitt Theatre and the men’s toilets in the exchange studio providing some flexibility. Although not a private facility all the needed requirements were met. Maidstone Museum – In the more modern side of the museum there is a good sized baby change area provided, clean and easily accessible and yet in the toilets nearest to the cafe, the baby change is based in the ladies toilet with no access for buggies and very little room. It is good to have two changing facilities but the Museum would have scored more highly if both change facilities were of the same standard. Pret a Manger – Good sized disabled toilet baby change facilities with enough room for a buggy, clean and with the basic facilities I would expect. Star Burger – Good cleanliness and access with the basic facilities needed – a little less room than some others in comparison. La Taberna – situated on the ground floor La Taberna provided all that was needed for a basic baby change with a good amount of space but cleanliness could have been better. Marks and Spencer – This is a spacious baby change facility but the area is cold and not as clean as I would have liked. Cafe Nero – Apart from the step into the actual cafe, the access was good but did not provide as big a space as some. Costa Coffee King Street – Good facility but the cleanliness let this down. Muggletons – Good access and sized disabled toilet baby change facilities but the room was rather smelly. Could have been cleaner. Buddha Belly – Good access and sized disabled toilet baby change facilities but the room was very smelly. Could have been cleaner. Wildwood – Good sized disabled toilet baby change facilities with enough room for a buggy and with the basic facilities I would expect. Could have been cleaner. Chimi Changa – Good sized disabled toilet baby change facilities with enough room for a buggy and with the basic facilities I would expect. Could have been cleaner. Pizza Express – via lift access the facility is clean, accessible and spacious with the basic facilities I would expect. Royal Star Arcade public conveniences – Baby change facilities in the main toilets with enough room for a buggy and with the basic facilities I would expect. Could have been cleaner and a private room more desireable. Nando’s – Should have been cleaner but accessible, roomy and with the basic facilities I would expect. Society Rooms – Situated in the disabled toilets on the ground floor level (ignore the baby change signs on the downstairs toilets – there is no baby change down there!) Everything was adequate. Could have been cleaner. KFC – Everything was adequate with good access. Could have been cleaner. Frederic – Clean and providing all that was needed but lacked space. American Diner – Clean and providing all that was needed but lacked space – questionable room for a buggy. Costa Coffee Fremlin Walk – Although easy to access and with the basic facilities wanted this scored badly as the cleanliness was poor. Pizza Hut – Access is not good with steps getting in the way but with the basic facilities I would expect. Eden – I would describe this as a little rustic. A stand alone baby changer in the vicinity of the ladies toilet, not very private and this could have been cleaner. Basic. Sizzle Grill – Disappointing. Was not very clean, you have to access the toilets past the kitchen area and although it provides a change area it is on a shelf with a changing mat rather than a pull down secure changer. The Munch House – This is not easily accessible for buggies or anyone with a baby and toddler as there are quite a few stairs. It is good they have a changing facility but it was unsatisfactory on every level. You may notice that Waterstones Cafe in Fremlin Walk is not listed above – this is because the cafe was under construction at the time of inspection and so there was no opportunity to inspect it. If you know of any other baby change facilities in Maidstone town centre you would like to tell us about then just let us know!